Curator of Horology Oli Cooke takes a closer look at a beautiful 17th-century clock that presents a novel way to tell the time in the middle of the night. The first thing to note is the unusual dial. Amid the beautifully organic, all-over floral engraving is the arc of a ‘wandering hour’ dial, so called because the hour numeral wanders up and over the arc during course of an hour – its position against the minute and quarter markings indicates the time. 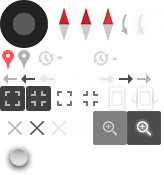 In the photo below, the clock is showing 12.14. At the end of an hour, the numeral disappears beyond the right-hand end of the arc and the next hour appears on the left-hand side. 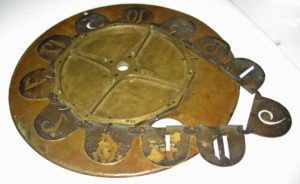 This is made to work by having the numerals on a chain, with consecutive hours set five numerals apart. 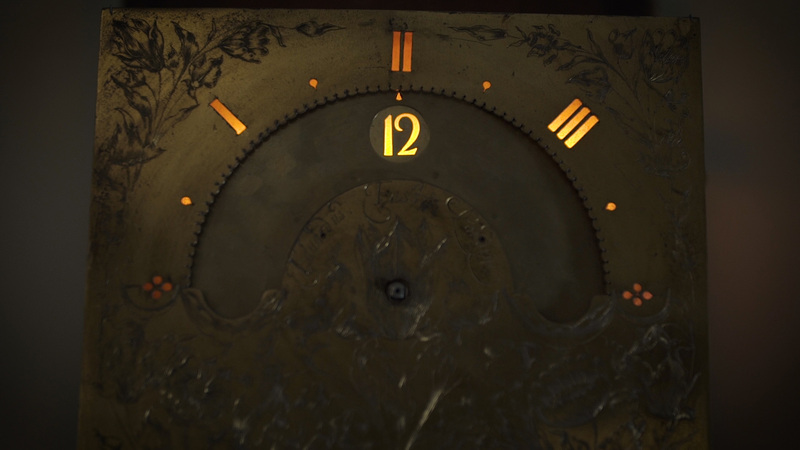 The chain of pierced-out hour numerals. The numerals and markings are cut out of the brass, which allows the light from an oil lamp or candle to shine through, thus allowing the time to be read at night. This was useful in the 17th century as one could not summon light with a mere flick of a switch. While many clocks of the time could sound the time by striking a bell, this would not do in the bed-chamber where it would wake the occupants every hour. Left: A modern work-lamp now rests on the bracket which was intended for an oil lamp or candle. Right: The illuminated dial. Close-up of the marquetry on the trunk door. Can you spot the butterfly and snail? 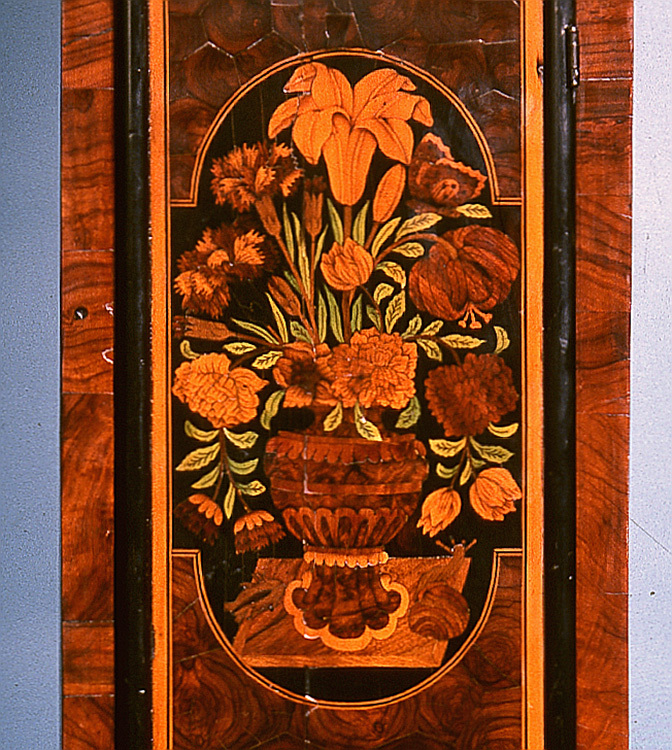 Let’s turn to the beautiful marquetry case. Marquetry is the decorative technique of inlaying different coloured woods to form naturalistic designs. 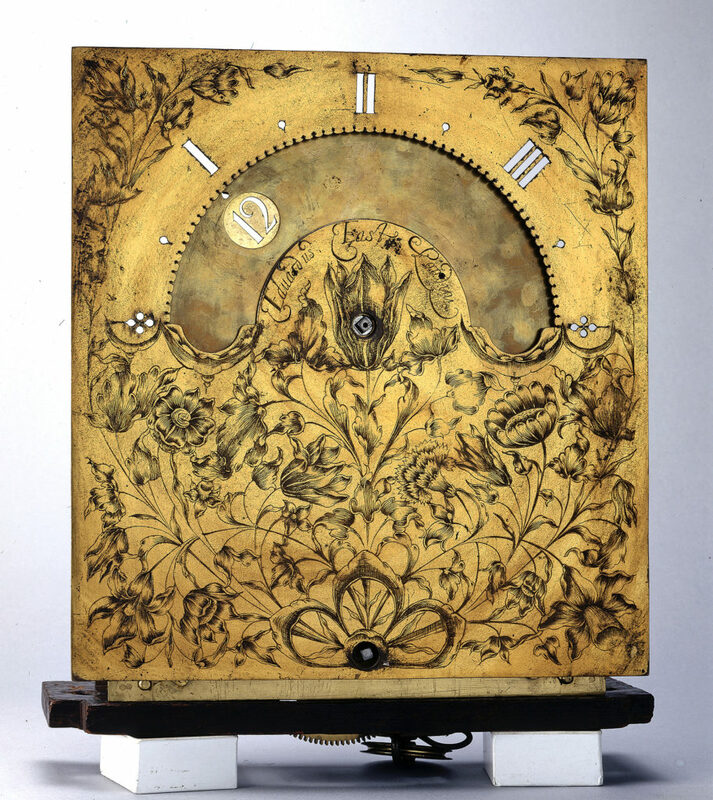 While the ‘bird and flower’ design seen here is a wonderful counterpart to the dial of this clock, we know by its style that the case must post-date it by 10 to 15 years (plus there is evidence that the case has been altered, suggesting that it originally housed a different sized dial). It is likely that the clock movement would have originally had a rather more austere case. The reason for this change could be that the original case became ashes. 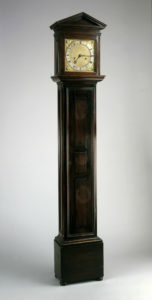 A more typical London longcase clock of c. 1700, by Joseph Knibb, c. 1675. Being fascinated with this clock, I started thinking about its maker, Edward East, and what other wonders he might have made. He was born in Southill, Bedfordshire, in 1602 and died around 1697. He lived through what was a very eventful century of English history. He had moved to London by 1618 when he became an apprentice of the Worshipful Company of Goldsmiths, serving under Richard Rogers, Comptroller of the Mint. He completed his apprenticeship in 1627 and by 1632 we know he was already well established in business, as he was named in the inaugural charter of the Worshipful Company of Clockmakers. Property records show that he remained active in business through the English Civil War and its aftermath. Just three months after the Restoration in 1660, he became clockmaker to King Charles II. In his time in London he survived three major outbreaks of plague and in 1666 was unlucky to lose his workshop to the Great Fire. He moved to Hampton Court in the 1690s, but continued to be involved in his business from there at least until 1694. The Museum holds one other clock and seven watches by East in the collection. Unusually for Museum objects, many clocks that were made after the 16th century were signed by their makers, which is useful in telling us where and when they were made. Having said that, we know that East was working for at least 67 years, so this does not really help us to pin down an accurate date for this clock. We do already know that it was probably not made after the invention of repeating work in the mid-1670s. Furthermore, it features another invention of around 1671 (the anchor escapement). So we can conservatively date the clock mechanism to around 1675. We might know who made the clock and when, but we do not know who first owned it. Only the very wealthy would have been able to afford a longcase clock at this time. Moreover, that it is a night clock and not a standard clock of the period possibly suggests that it was a commission. So, who would want or need to know the time in a dark room? Well, Pope Alexander VII for one, who in 1655 ordered Cardinal Farnese to provide a clock which would show the hours at night and in silence. Three brothers from Umbria rose to the challenge and invented the wandering hour dial, later used on some English clocks such as the East one. Also, in his diary, Samuel Pepys tells us that on Friday 24 June 1664 he was shown Catherine of Braganza’s bed-chamber ‘with her clock by her bed-side, wherein a lamp burns that tells her the time of the night at any time’. The East night clock of around 1675 is clearly not that clock, but you can at least see the high status of those who might have originally owned this wonderful clock.